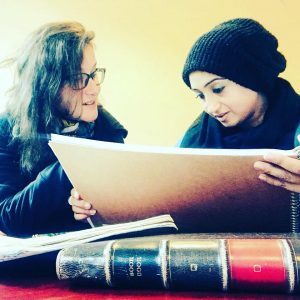 Hafsah Aneela Bashir and Nikki Mailer, two kindred spirits with different arts practices, became friends in 2015 and set up Outside the Frame Arts collective because they both felt there were many valuable voices absent from the mainstream. They had a strong desire to create an arts collective that dovetailed arts and activism, something they are both passionate about. Hafsah’s Muslim background and Nikki’s Jewish background informed their experiences both creatively and politically. Their love of collaboration and a strong pull to continue the work and its positive impact inspired them to form projects together.